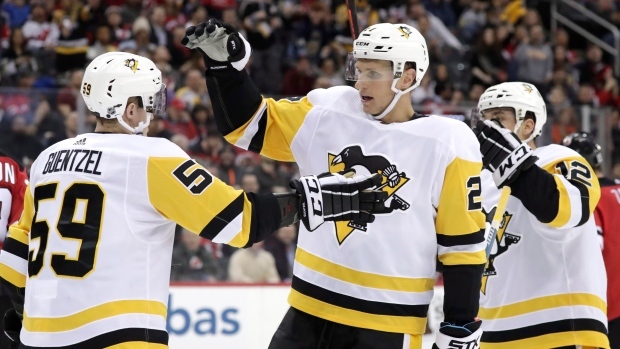 NEWARK, N.J. — The Pittsburgh Penguins seem to be getting their act together for a playoff push and one clear sign of that is finally finding a way to beat the New Jersey Devils. NOTES: The Devils gave the first 9,000 fans in attendance a David Puddy bobblehead. He's the Seinfeld television show character portrayed by Patrick Warburton, who painted his face in Devils' colours in an episode and shouted "We're the Devils." ... Travis Zajac appeared in his 900th game with the Devils. ... Penguins Matt Cullen will tie Phil Housley for third most games (1,495) by an American-born player the next time he takes the ice. ... The Devils activated F Blake Coleman off injured reserve and assigned F Nick Lappin to Binghamton (AHL).